Along with increasing market competency, companies are moving toward greater adoption of design thinking techniques as tools to put their consumers in the heart of the development process. The goal is to build a consumer-driven culture inside the organization. The company that was always known for its software and hardware products is turning to a design-led business trend through its design thinking model, yet the challenge was that the design thinking model proposed by IDEO is more suitable for creative SMEs than for large enterprises. 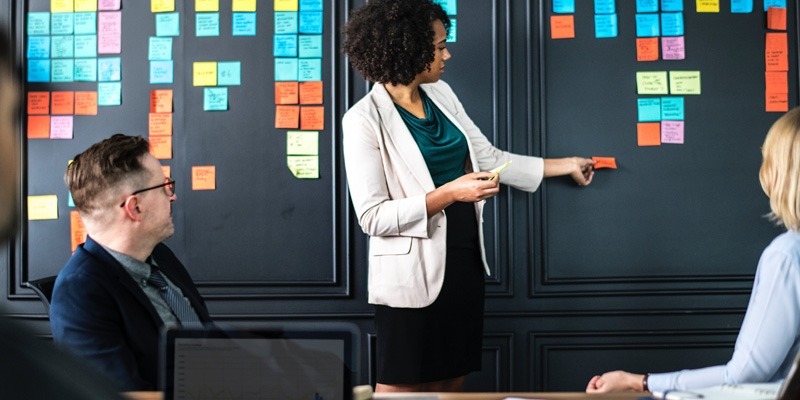 According to Wired magazine, Charlie Hill, chief technology officer of IBM Design, indicated that the adoption of a traditional design thinking process by large companies such as IBM may lead to breakdown. However, the company can use the process as guidelines to draw its own process characteristics based on the existing complex business. “When you look at a lot of the established representations of design thinking, we found that in practice they feel a little bit ‘waterfall-y,’” Hill says. 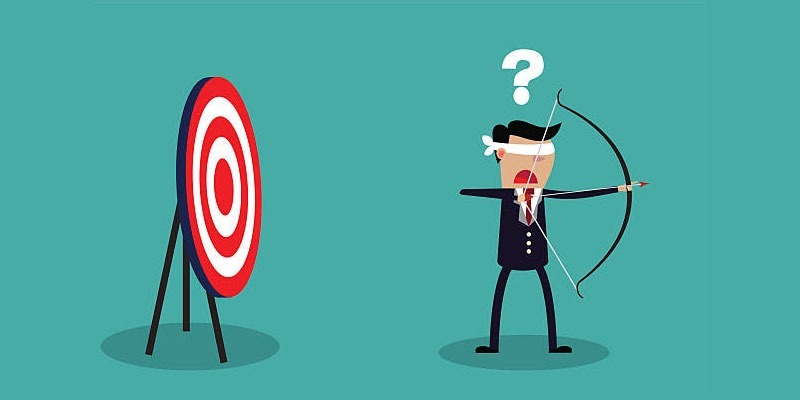 The term “waterfall-y” refers to the fact that even large companies find themselves adopting steps similar to the traditional process: empathize, define, ideate, prototype, test. In 2013, IBM started to build a design-driven culture at the largest scale ever, in a company with more than 385,000 employees. The project took three years, involved more than 750 designers, and affected over 10,000 employees and hundreds of teams. The final IBM design thinking model is available for public access with practice. The main idea behind the model is to apply design thinking to understand consumers and build empathy. The target was to apply this with the speed and scale that modern companies demand. The IBM design thinking model focuses on building a deep understanding and empathy for the consumer through the principles, the loop, and the keys as following. Three principles form IBM design thinking model: the focus on user outcome, multidisciplinary teams, and restless reinvention. The first principle is to put the user in needs in the first business priority in order to achieve good design from the client perspective. This principle is visualized with the yellow circle in the loop. The multidisciplinary team is a collaborative team with all the stockholders in the organization aiming to move faster and smarter. IBM describes the teamwork as “Empathy: first with each other, then with our users.” This principle is represented in the loop as three green circles. The main principle that frame the above two is the loop itself. The restless reinvention tends to build an iterative process. The process is based on prototyping solutions for old problems with new ways based on actions. Keeping in mind that nothing is perfect, this turns every product into a prototype that is a case for iteration and development. 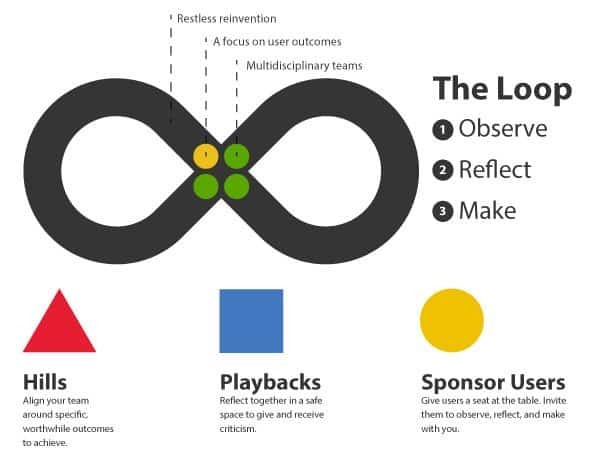 The loop is the pathway for IBM’s design thinking process that is based on three main steps: Observe, Reflect, and Make. First, you start with observation to improve your understanding about the problem. Then, you move to reflect the acquired knowledge on your own knowledge to adapt it into a plan. The third step turns this understanding into a prototype and delivers it in the form of an outcome. Unlike adopting design thinking in small companies, large companies require a more scalable model that can help them to solve complex problems. The third part of the model reflects the need to be scalable. While the loop is enough for small problems, complex problems require collaboration with complex teams. Therefore, IBM proposed three techniques to achieve this scalability: Hills, Playbacks, and Sponsor Users. The first technique, Hills, aims to clearly define the intent through the teams. This intent is actually the users’ needs put in the form of project goals. This intent should clearly define “who,” “what,” and “wow.” IBM provided an example with President John F. Kennedy’s statement “I believe that this nation should commit itself to achieving the goal … of landing a man on the Moon and returning him safely to Earth.” So, “who” reflects the American nation, “what” is reflected as the goal, and “wow” is reflected as a measurement of success, which is safely returning the traveler. 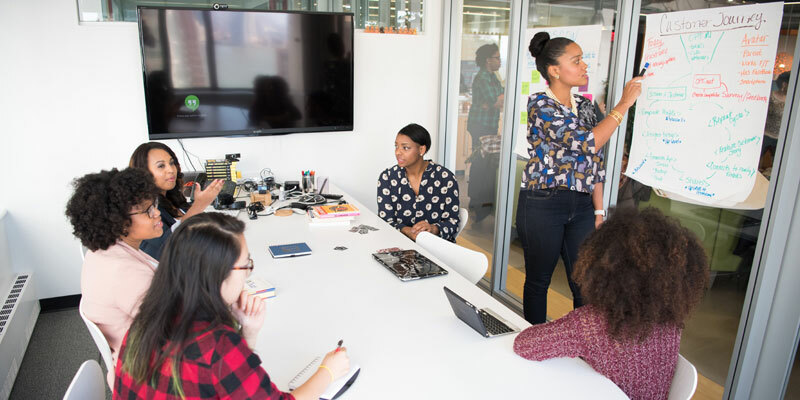 After three years of development, IBM released its design thinking model with the goal of overcoming the traditional model’s adoption barriers for large companies. IBM’s design thinking model puts the consumer in the heart of the development process, which is known as the Loop. The Loop principles and techniques provide a practical approach to how to solve complex project problems with the consumer in mind, regardless of the size of the problem, the project, or the number of stakeholders.